Benjamin Britten; Ludwig van Beethoven. Very Good. In very good packaging. 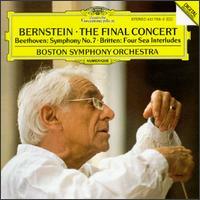 Leonard Bernstein-The Final Concert by Leonard Bernstein. Benjamin Britten; Ludwig van Beethoven. New. Very Good. 028943176828 Your purchase benefits those with developmental disabilities to live a better quality of life. VG+/VG+ Beethoven: Symphony No. 7 + Britten: Four Sea Interludes. 028943176828. Very Good. 028943176828 disc(s) free of scratches and plays great, light wear to case, ships same day or next.